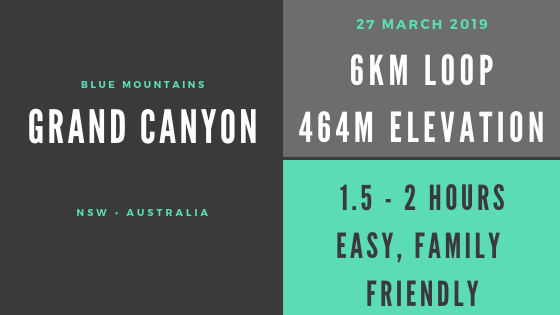 In a strange twist of fate, my last big hike to finish the 2018 season was in the Grand Canyon, Arizona, and my first hike to kick off this 2019 season was also the Grand Canyon... in the Blue Mountains, NSW, Australia! Today's hike was a little less demanding than the hike I did with Wildland International in October! 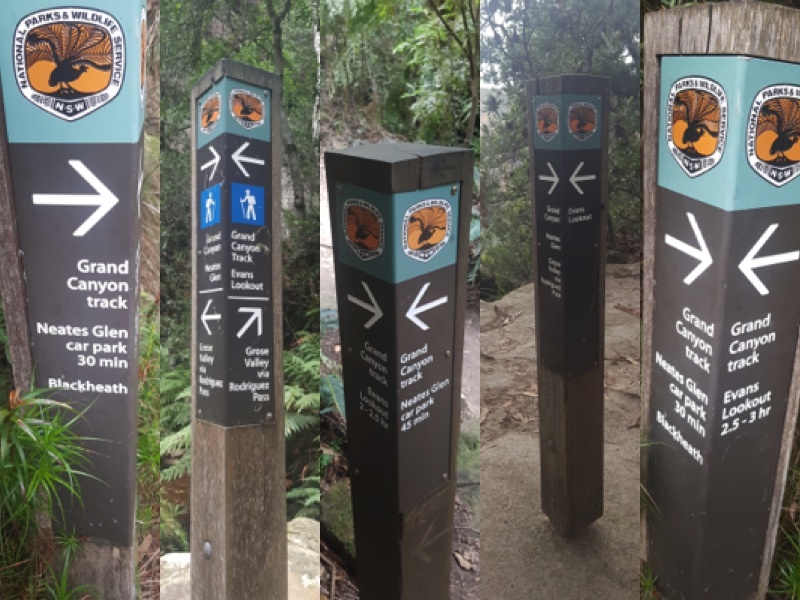 The trail summary is shown in a nutshell on the left for quick reference, and a more detailled description and photos follow below. I've held off from hiking over here until the cooler Autumn temps arrived, as I am woefully ill-equipped to deal with warm weather. 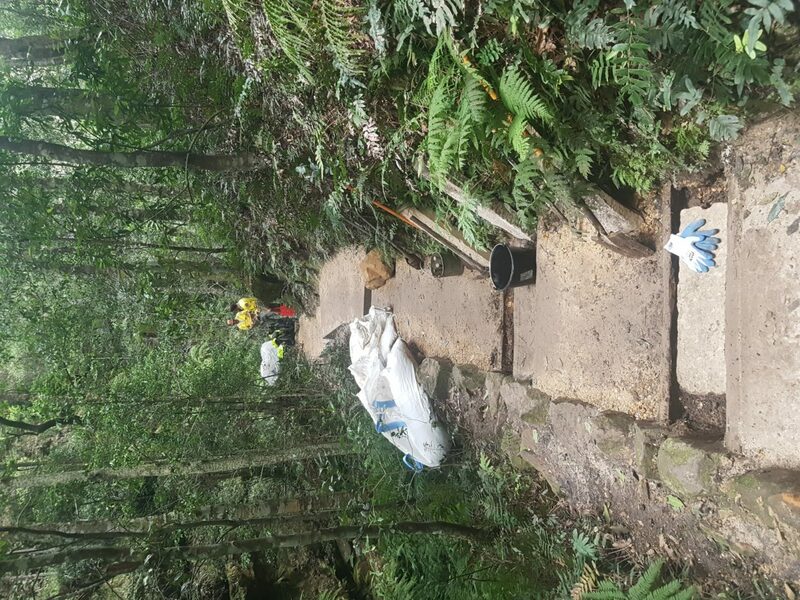 So, following a few rainy weekends, I've started my proper forays out into the Blue Mountains. I left for the trailhead at 8am, and by 9am I had my bag packed, shoes on and I was ready to hit the trail. It was a brisk (!) 18 degrees when I left the car and set off down the canyon. 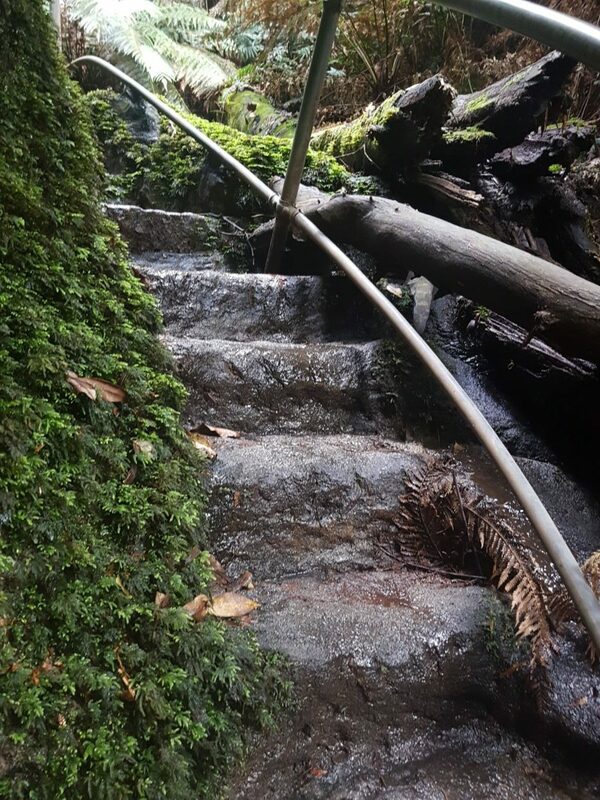 The first km is entirely downhill, plunging down into the canyon on moss-covered stone steps hewn into the path. The occasional metal railing lines the trail when the drop offs become slightly steeper, windier or the steps are particularly worn. I noticed the temperature dropping as I descended, and kept my pace up to keep warm. Before long, I found myself deep in the canyon, sandstone cliffs rising up high either side of me, surrounded by tropical ferns, thick, strong vines and all different kinds of moss. One of the more remarkable things I've noticed about Australia is the multitude of different birds that reside here. In the canyon, their chirrups and tweets reverberated around creating pleasing echoes of sound. This was complimented by the steady drip of water condensing off the plants and falling into the chasm, and occasional rush of moving water when the river came in sight. The next couple of kms pass through the canyon, following the bench that the river left behind before continuing to erode further down into the canyon. Parts of the trail go beneath huge sandstone outcrops, and the clearance is only about 1.8m (I'm 172cm and I had to duck my head a number of times). There's even a short section that takes you through a dark cave, which is fun. Descending down the final set of stairs into the lower part of the canyon which runs along the creek, I heard a voice call out. "Hello? ", it called, and I responded in kind. At the foot of the stairs I met Will, a Chinese tourist. He was over from Shanghai, and enjoying a final walk in the mountains before spending his last day in Australia at the beach in Bondi. He and I walked together for a few hundred meters, and bonded through the spooky darkness of the cave, before he paused to take more in depth photos and I forged on ahead. I was glad I was alone for the next part, as it really felt like I'd stumbled into Fern Gully. Incredible scenes unfolded as I wandered my way through the forest, which had suddenly become much quieter. The water was calm here, and the trail criss crossed it many times. I was pleased I was tackling this in the autumn, and not during a rainier season otherwise I definitely would have had wet feet! I passed one waterfall after another; one in particular stood out and would have made an excellent spot to cool off if I'd have been struggling with the heat. I completely lost track of time, and took over 100 photos! Most of these are close ups of leaves I found exciting, and generally not worthy of internet fame. Just up and around the corner from the stairs in the photo on the right, I caught sight of something moving and stopped dead in my tracks. My instincts immediately went to bear, and when I remembered I was in Australia I had a proper laugh at myself. It wasn't a koala, or a drop bear, and I don't think there are any other kinds in Oz! No, it turns out it was a Superb Lyrebird, and very aptly named it is too! (That link is really cool, it has sound clips of the bird mimicking others, and actually gives a great feel for how it sounded in the canyon) They are so well camouflaged, that it's no surprise I didn't notice it til I was right on top of it. It scarcely even acknowledged I was there, however, and carried about its day. Undulating trails became steps, and eventually just one, long, relentless stairway up and out of the canyon, where I was rewarded with spectacular views into the other side of the canyon from Evans Point lookout. Time after time I was blown away by the craftsmanship of the trails - the photo above is just one example of how well they are created and maintained. I passed very few other people on the trail, and was grateful to have this slice of heaven on earth to myself. It's only about 2kms, and I loved every second of it! Even though I was only out for 1hr 22mins it was jarring to see lots of people at the lookout. And by lots, I mean 10. 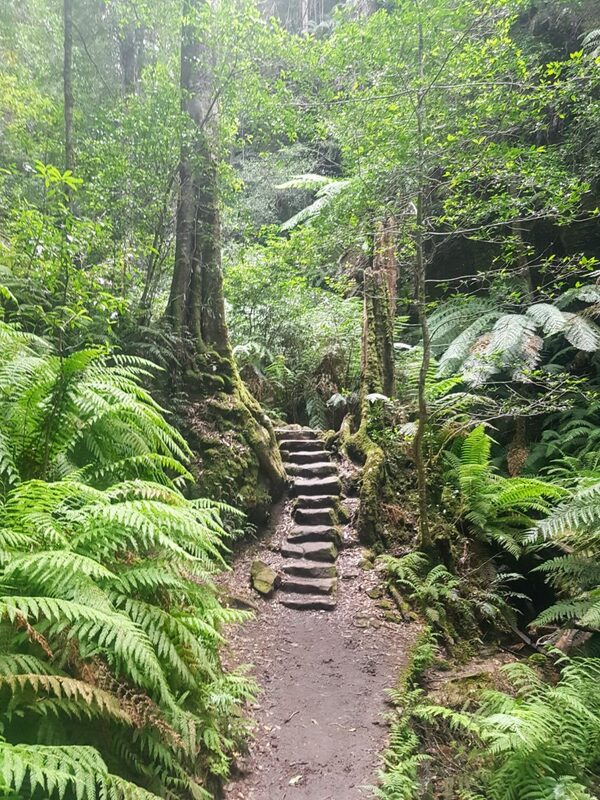 It felt so good to be alone wandering in the forest again after a few hot, sticky months traveling up and down the busier coastline of Australia. I'm going back as soon as I can for more of this stunning place!